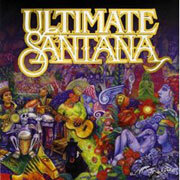 Following the success of his three "revival" albums (Supernatural, Shaman, and All That I Am), Carlos Santana released the career-spanning CD Ultimate Santana. This album includes cuts from the first two of the aforementioned albums, in addition to his most popular songs from the last four decades. "Into the Night," the first single from the album, is a collaboration between Santana and Chad Kroeger, singer from Nickelback. A throwback to the flavor of "Smooth" from Supernatural, Into the Night returns Carlos to his beloved Dorian mode with it's trademark four chord progression: i - III - VII - IV (Am - C - G - D). Unlike some of the other hits from his latest albums, Into the Night feels more like a classic Santana song, complete with prominent Latin percussion (both congas and timbales). Not surprising, since the song was co-written by Chad and Carlos. In addition, Santana's guitar forms an integral part of the melody, with repeating hooks throughout. Into the Night's video has Carlos Santana and Chad Kroeger playing on a rooftop, while Freddy Rodriguez (Ugly Betty) abandons his thoughts of suicide after he sees a girl dancing in a neighboring apartment. Although the song's pedestrian lyrics don't quite live up to the clever wordplay in the earlier "Smooth," Santana's guitar work and Kroeger's vocal tone blend well, and the Latin percussion gives the modern-sounding song an added kick. All in all, it's clear why Into the Night has become a hit.